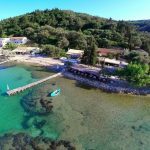 Boukari is a picturesque fishing village located 26 km from Corfu Town. The main beach of Boukari distinguishes for its crystalline and shallow waters that provides safety to all visitors and especially the children. 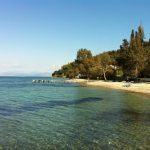 The area is conspicuous for its prominent location offering a breathtaking view of Corfu and its lush green surroundings. This beach attracts mostly families seeking relaxing and peaceful vacation. Boukari beach is surrounded by a vast area of olive groves that provide natural shade to the visitors. It is relatively small with no beach facilities. There is only a cantine serving drinks and snacks. The beach is quite unspoiled with excellent waters and tranquil atmosphere. In the wider area you will find a plethora of hotels and many fish taverns that the village is famous for. In close distance from Boukari, about 3km away is the picturesque village of Messonghi, a verdurous area ideal for hiking adventures. On your way back to Boukari you will meet the fishing village of Petriti.